The island of Skiathos has many restaurants. Some Skiathos restaurants serve typical Greek dishes with fresh fish or grilled meat, while others have more international menus. Skiathos restaurants are scattered all around the island. The majority is situated at the main town and at the southern side of Skiathos, where are the most popular beaches, like Koukounaries, Agia Paraskevi, Vassilias, Vromolimnos and others. 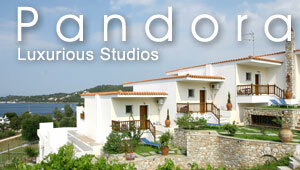 Here are some nice restaurants in Skiathos. Each restaurant is presented with detailed text, photos and point on Google map. If you have visited any of these restaurants, feel free to write your review. All request forms go directly to the restaurant manager so that you can make a reservation in person or ask them any question. Located in the beautiful area of Platanias, close to Agia Paraskevi, Calma is a family-run tavern with a delicate Greek atmosphere and a traditional menu with homemade dishes. Green Park is a peaceful restaurant, part of an accommodation complex in Agia Paraskevi. The beautiful restaurant is surrounded by a pool and a large garden with colorful flowers and tall trees providing cool atmosphere. Infinity Blue is a premium restaurant built on the tints of the sea in a beautiful area overlooking Kolios bay and the neighboring island of Skopelos. With minimal decoration and a huge plane tree standing in the middle of the restaurant, Mesostrato is an interesting post-modern Greek tavern. Mouragio ouzeri-fish tavern as Greeks call it, is located by the main port of Skiathos and has set the standard for drinking ouzo and tsipouro. Our friends along with sipping ouzo and or tsipouro can also have lunch-the kitchen offers a many home cooked dishes. Our food is prepared freshly for you using only the finest ingredients. Our menu is varied and combines fine traditional Greek recipes with other exciting dishes from around the world. We offer our customers a well stocked wine cellar and a comprehensive bar. A bustling restaurant on the main road of Agia Paraskevi, Jimmy's is a popular place offering Greek food. It is a family-run business with warm hospitality and beautiful atmosphere. Definitely try some of the homemade dishes and the traditional desserts with syrup. Maistrali has an extensive choice of local dishes and an interesting list of wines. The restaurant opened in 2001 and since then it has become a classic spot due to the wonderful tastes and warm hospitality. In summer, guests sit outside and admire the setting.